Live the fantasy! Here's your chance to stay in a fourteenth-century Bavarian castle. Well placed for day trips along the Romantic Road and beyond, the castle is surrounded by natural beauty. Experience history, culture, and warm German hospitality in a uniquely personal way. Stay in a comfortable private vacation apartment in an historic castle. Day trip options: Rothenburg, Dinkelsbühl, Nuremberg, Ansbach, Wolframs-Eschenbach, Munich, Würzburg, Bamberg, Regensburg and more! Day trips: Just a few of the short day trips possible from the castle: Rothenburg, Dinkelsbühl, Nuremberg, Ansbach, Wolframs-Eschenbach, Munich, Würzburg, Bamberg and Regensburg. Delightful longer day trips include King Ludwig’s castle at Neuschwanstein, Garmisch-Partenkirchen, Oberammergau, Heidelberg and even Salzburg. 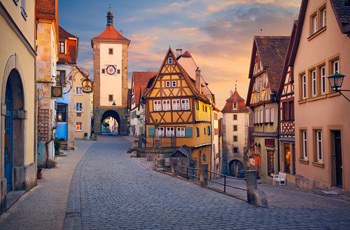 Sightseeing you’ll want to consider: The walled town of Wolframs-Eschenbach with its many well-preserved, half-timbered houses, the Albrecht Dürer House (Germany’s greatest Renaissance artist), the well-preserved castle in Nuremberg, the cobblestone streets, gabled houses, ramparts and towers of Romantic Road towns like Dinkelsbühl and Rothenburg. Farther away, you can enjoy Oberammergau, the small town that attracts world attention with its Passion Play, and the many delights of cultured Salzburg and carefree Munich. Off-the-beaten-track treasures that can’t be beat: There’s a wonderful assortment of off-the-beaten-track activities right here in the castle’s neighborhood, including several ponds and a lovely garden within the castle grounds. The Baron’s family has owned the castle since the sixteenth century. His graciousness and hospitality provide for a memorable stay that includes informal orientations upon arrival and later during your stay, a grand tour of the castle. Visit nearby Lake Gunzenhausen to enjoy paddleboats, wind surfing and biking. Or take a cool swim and have a picnic lunch as the locals do. The Baron and his staff are always happy to inform you of the many activities and festivals in the nearby towns. One or two weeks in a private apartment in a medieval 14th century castle in Bavaria. Car rental for the duration of your Untour. An orientation session with the Baron, your host, covering sightseeing, local events, concerts, and festivals. A regional map and our own Untouring Bavaria guidebook, researched and written by Untours staff, full of the best restaurants, sightseeing, and other suggestions. A cultural event, like a tour of the castle hosted by the Baron and his wife.